The LGFA’s 2017 Player of the Year is currently working on Leeside. Noelle Healy celebrates Dublin's 2017 All-Ireland final win. 2017 PLAYER OF THE year and three-time All-Ireland winner with Dublin Noelle Healy has applied for a transfer to reigning All-Ireland senior club champions Mourneabbey. The42 understands that the Dublin star has requested to move from Castleknock outfit St Brigid’s to the Cork club after a change in location for work. Healy’s release has been approved by St Brigid’s and Dublin, but the transfer will now need approval in Cork before it is completed. Four-time All-Star Healy balances her inter-county career with a demanding job as an anaesthetist and is working on Leeside at the moment. The star forward didn’t feature for the Sky Blues in their league openers against Donegal and Tipperary, but that was expected with a host of regulars including Sinéad Aherne and Sinéad Goldrick also absent. Healy, 28, was there as Dublin won their first-ever All-Ireland senor title in 2010, and bridged the seven-year gap with another in 2017. 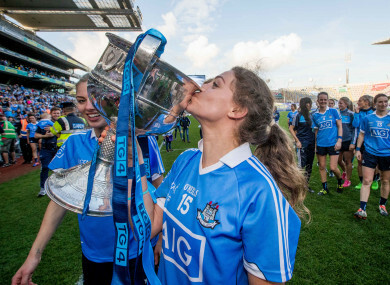 Through a devastating Player of the Match performance, she inspired Mick Bohan’s Dublin to put three years of hurt and heartbreak at the hands of Cork to bed as they lifted the Brendan Martin Cup after beating Mayo. They made history in September by winning back-to-back titles for the first time, this time overcoming their old Rebel foes in Croke Park. Last May, they lifted their first-ever Lidl Ladies National Football League Division 1 title in Parnell Park. Shane Ronayne’s Mourneabbey also wrote history of their own at the Donnycarney venue last year as they ended a long, long wait for All-Ireland senior club glory. They saw off Dublin kingpins Foxrock-Cabinteely — who beat Healy’s home club St Brigid’s in the county final — in the national showpiece. The five in-a-row Cork and Munster champions finally put three painful decider defeats (2014, 2015 and 2017) and a semi-final loss (2016) to bed as they lifted the Dolores Tyrrell Memorial Cup. Mourneabbey have now completed a historic treble after lifting the All-Ireland junior title in 2005 and adding the intermediate crown to their cabinet in 2007. They become the first-ever ladies football club in the country to make it three titles across three grades. Email “Dublin star Healy applies for transfer to Cork's All-Ireland club champions Mourneabbey”. Feedback on “Dublin star Healy applies for transfer to Cork's All-Ireland club champions Mourneabbey”.